After everyone left from Sam’s birthday party, they are all playing together. Legos are scattered over the floor while each of them — all four — are crunched over their creations in quiet concentration. I smile at the snap of bricks and the shuffle of blocks and the sweet words. I sink into the brown leather couch next to Andy and stretch my legs across his lap. He pats my knee once. Twice. Just like he’s done for the past 18 years. He smiles and I know he’s thinking what I’m thinking. This family life is very good. It’s only a moment and then he can’t stand it any longer. He must join them. He slides off of the couch onto the floor and folds his body over his knees — a bigger version of who he was 30 years ago. They keep playing, making space for him and including him in their conversation about colors and block sizes and the stories they are constructing. And there’s this peace that goes deep — not only to my toes, but through my bones too. 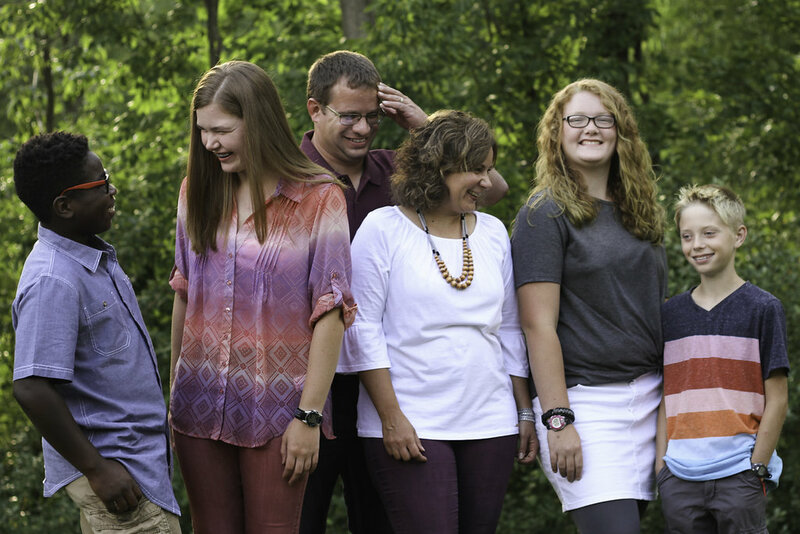 And I know, knowknowknow, that this is going to work out because I’m catching a glimpse of our new normal – our family of six. The Lord gives his people strength.The Lord blesses them with peace. It’s a peace that sustains me. Even when the world might look in and wonder how so much chaos can fill one home, I feel peace. Strength. Love. I don’t want to move, don’t want to disturb the magic of play and creating and softly spoken sweet words. But I don’t want to forget either. So I get my phone from the kitchen and I snap a picture. It’s the kind of shot I like best. It is perfectly imperfect. I wish I moved the trash bag of wrapping paper from the rocking chair and Hannah is hidden, but it captures the moment. I remember peace. This is why I collect the moments. I learn from them, stitching my story into something significant. Beautiful, Ruth. I love that you shared this. I second that comment. Beautiful. Thank goodness for phones that are multipurpose! Snap, and the peace of the moment is preserved and you can revel in it when you revisit that photo. This is a good place to be. Thank you for sharing your words keep it up.